The party is just getting started, so head on down and win yourself a stack of cash! Click here to play! The beach is almost full and the slots fun has just begun. 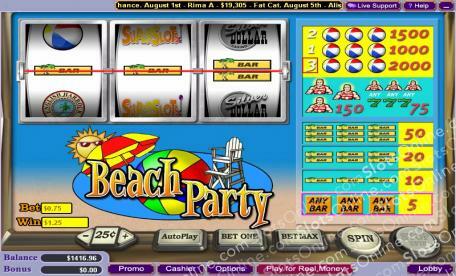 Beach Party is an entertaining 3-reel slot played across a single pay line. You can play one, two, or three coins, with the maximum number allowing your payout odds to increase for winning combinations. Try to avoid the Casino logo as it doesn't pay out, but keep your eyes on the Bars, 7s, and Lifeguards, as they will all go a long way to filling up your pockets with cash. If you manage to spin all three Beach Balls in one go you will be rewarded with up to 2000 times your initial wager! The Beach Party won't start until you arrive, so make sure you are in the mood for fun and plenty of cash jackpots!